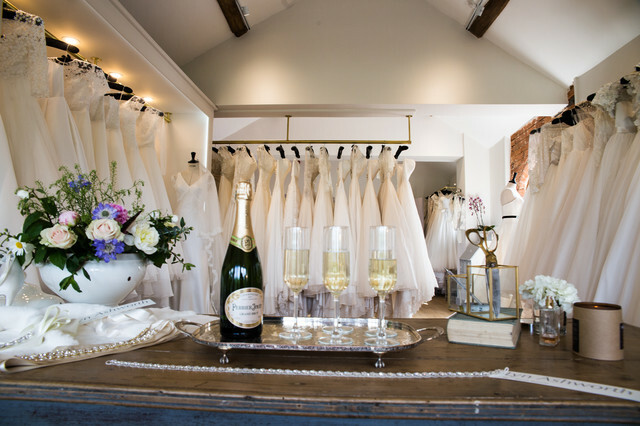 Acclaimed British bridal brand Lyn Ashworth, with creative director Sarah Barrett at the helm, have opened the doors to their very first standalone flagship boutique in Staffordshire. In the picturesque farming village of Kingstanding, close to Burton On Trent, the new boutique sits in a beautiful barn conversion with spectacular views across the countryside. With both manufacturing and retail premises in the same site, the flagship store will not only offer brides the chance to browse and try current and past collections, but also the option to design and create something entirely bespoke with Sarah's talented team. Alongside the highly acclaimed Daydream collection of 2018, brides will be able to sample the forthcoming Pure Love collection of 2019, as well as best sellers and favourites from collections of years gone by. The boutqiue also stocks a wide range of shoes, hair accessories and jewellery to help brides complete their look. We love how spacious and light the boutique feels, with plenty of space for twirling around in those beautiful dresses! The barn setting feels modern and unpretencious, and has everything you need to enjoy the perfect bridal shopping experience. Visits to the bouique are by appointment only, which you can make by calling +44(0) 1283 820643, or by visiting the Lyn Ashworth website.